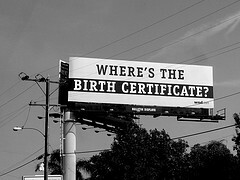 The President made the correct decision by releasing his birth certificate. Those who continue to snipe and twitch about his citizenship will reveal themselves for the defective hate mongers they actually are. Their continued whining will discredit not only themselves, but their political efforts as well for the majority of Americans will look askance to such small-mindedness. Cooperating with a detractor’s demand is not necessarily an act of weakness. In this case, Mr. Obama has effectively ended “any reasonable person’s doubt” and forced said detractors into an untenable position. He is in a much stronger position now than he would have been if he stubbornly allowed this matter to even appear to have some legitimacy by not providing his birth certificate. What is galling is the child-like mentality of the persons who called for his birth certificate in the first place. Why is it necessary for Mr. Obama to provide such evidence when others did not have to do so? How is it “okay” for the rules to change for Mr. Obama? By the way, but not incidentally, when one refers to our chief executive, one is supposed to say Mr. President or President Obama; not Obama! He is not “some guy!” He is the President of OUR nation. To disrespect him is to disrespect ourselves and “the system” under which we live– id est our government. The President is OUR President regardless to which party he/she belongs or his/her/ethnic background! Either we take ourselves seriously as Americans consistently or let’s call the whole damn thing what it recently has started to appear to be: a farce!